Those gold-plated public sector pensions? This entry was posted in Blogpost and tagged economy, Pensions, public sector, public sector pensions on May 10, 2017 by brianmlucey. This is an extended version of an opinion piece published in the irish examiner. 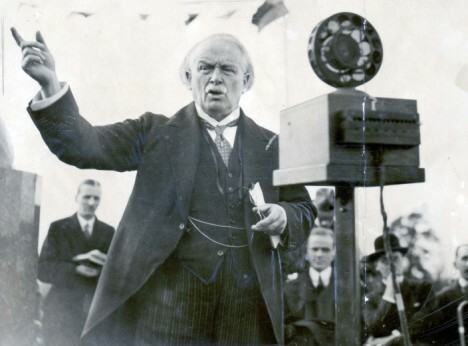 In 1908 David Lloyd George, the then chancellor of the exchequer in the United Kingdom of Great Britain and Ireland steered through, against some considerable opposition, a revolution in social welfare. The idea was simple and yet radical : that people in their old age, unable to work, should have a modest stipend and not be a burden on their families. Ireland of course benefited from this also, and over 170,000 pensioners obtained some pension, the 1908 act providing for means testing. Since then pension provision has evolved massively. But in Ireland we face now not one but three interlinked pension problems. Pensions are in principle a fairly simple thing: you put aside a sum of money on which you can draw for future needs. The problem arises in that it is inherently an act of forecasting. Consider the elements involved. You need to first forecast how long after retirement you are likely to live. Then you need to forecast how much income you will need for each of these years. Then you need to forecast how much time there is until you retire, and by how much you expect each sum of money you put away to grow over that period. Each of these forecasts must be more or less on the button if the final equation is to be correct. (for more on the underlying equations see here ) Not surprisingly therefore pension planning is complex. Most people underprovide for their pension which means that a significant burden then lies on the state. The pensions board provides a pensions calculator which I suggest would horrify most when they plug in their details. The reality is that we are underfunded in al pension areas. 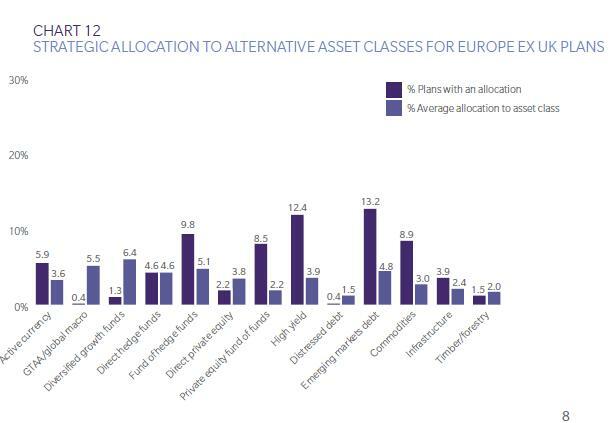 Irish people are not very financially literate and we pay very high fees for pension fund management, much of which is based on asset levels not on actual performance. The pension issue in Ireland is complicated by the fact that we have a mixture of pay as you go pensions and traditional pension savings as noted above. And even within that there are shades. 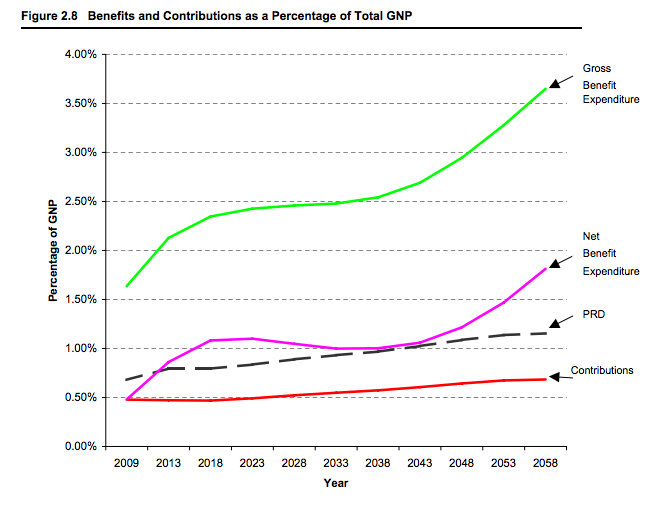 One split is on defined benefit (where at retirement you get a set % of your final or average lifetime salary) and the pension fund is supposed to have enough in the savings pot to meet this, while the other is defined contribution (where the pension is in effect determined by how much if any is in the savings pot). And then we have pay as you go pensions, in the public sphere, where pension payments are in effect paid out of current tax revenue. All these are in crisis. In the realm of public sector pensions there was a report in 2008 by the comptroller and auditor general that looked at the future liability of the state for public sector pensions. This found that there was a “contingent liability” of some €100b. While that is a shocking amount of money, it must be placed in context. It does not mean that the state owes 100b. It does mean that, based on a certain set of forecasts (how many pensioners will live for how long and at what rate their pension needs will grow) that a sum of 100b would be needed if one wanted to at that time invest at a particular rate of return to obtain an income stream that would meet this. 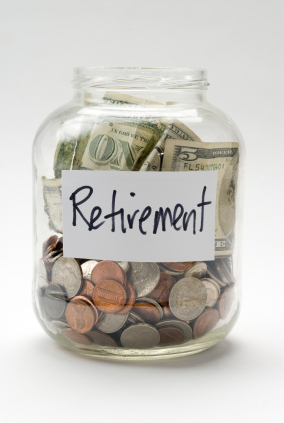 Its also important to note that this is a sum that would be required to meet the pension liabilities over 50 years. At present public sector pensions are paid for in the main out of current tax revenue. There was a national pension reserve fund, which was an excellent idea of Charlie McCreevy to set aside a fund that over time would build up and generate income to pay public sector pension liabilities. This fund alas has been poured into the bottomless pit of the Irish banks. When next we hear criticism of public sector pensions from the private sector it might be useful to note that the cure for the overhang was dissipated in private interests. How to deal with the existing public sector pension bill is a problem, but at least the government have taken steps (reduced entitlements, longer waiting times to benefits, increased contributions) for new entrants. That is not enough for the critics of public sector pension provision however, who (quite rightly) draw attention to the overhand, and then complain about the existing pension provisions without suggesting realitic reforms. Absent simply writing down existing legal provisions (a dangerous route) there is little that can be done in the shortterm to reduce the bill. In any case, reducing the existing pension bill will do nothing to increase the pension pots of anyone who has suffered losses. we also have, as I have noted before, the issue of the unfunded liability of the noncontributory pensions. Public sector pension costs are circa €4b per annum. Non contributory pensions (old age mainly) are c €1b, and the state also subvents (tops up) the social insurance fund (which is the fund into which PRSI etc is paid and out of which contributory pensions etc are paid) by nearly €2b. Thus it would be fair to say that applying the same logic to these as to the public sector pension issue we face a state overhang of between €25 and €75b. However, we hear very little of this. The perception is that we are a very young population – this is true but the % of the population over 65 here is 18% compared to a OECD average of 23%. 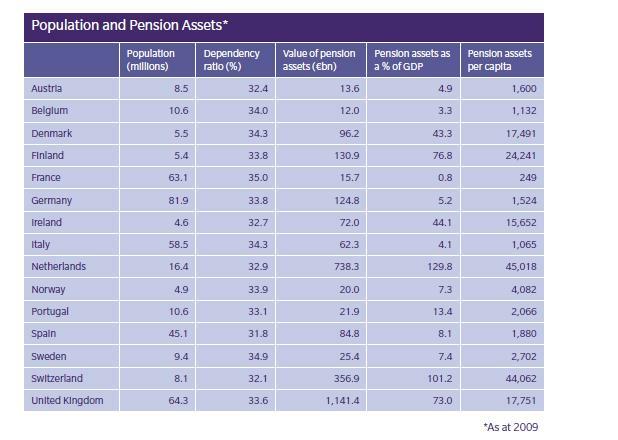 Yet we spend only 3.6% GDP on pension provision compared to over 7% on average. We face a massive change in the next 30 years in our population pyramidand we need to begin to save for this. (here is a link to an OECD population pyramid , in Excel format). 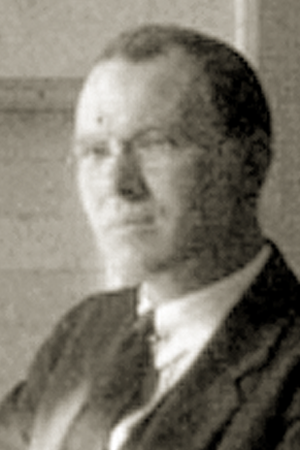 State old age pensions have remained untouched over the crisis – the ghost of Ernest Blythe hangs long over the state. In the private sector we have seen the massive destruction of wealth and pension funds have not been spared. Up to 80% of defined benefit schemes are estimated to be in deficit. We have seen the closing to new entrants of defined benefit schemes, and where such schemes do exist we have seen cases such as Waterford crystal where the fund was not able to provide its warranted requirements. A further complication here is that the government has refused to implement EU requirements for a pension protection fund (which would of course involve a levy). The UK government also refused and was forced to implement same only after a long legal battle. Thus in addition to the public sector pension overhang the government face a large bill, possibly running into the hudreds of billions should, as expected, the European court rule that it was in breach of its requirement to have put a pension protection fund in place. The last thing the Irish state needs now is additional financial strain but it is highly likely that that will be forthcoming. For those that choose defined contribution funds there has been a horrific loss of value over the last number of years. That said, the indications are that Irish households are holding increased financial assets, and the declines in pension fund reserves are not nearly as large as the declines in domestic financial asset values. Irish household wealth has fallen but stripping out the house value falls this is not significant. That is important as it suggests, along with other trends in savings that whether by a sense of fear or a sense of requirement Irish people can increase savings levels. If the government can, through imaginative means increase savings they will have done a good days work. This entry was posted in Journalism, Uncategorized and tagged economy, Pensions on July 20, 2012 by brianmlucey. Last week we saw international women’s day, a day that in theory is devoted to the celebration of female achievement. It is celebrated as a public holiday in some countries, mainly those part of the ex soviet bloc, where the holiday originated. Originally an overtly political event that trumpeted the (real, if with mixed outcomes) achievements of the soviet state in enshrining women’s rights, it has more generally evolved to be a celebration of women and female achievements. This weekend sees Mothers Day, a very mobile feast, which of course celebrates mothers and motherhood. Perhaps the time then is right to consider what finance has to say about women, and in particular to look at some recent research. I dont refer here to personal financial management, although this is an area where women also show distinct differences, but to ‘professional’ financial activities. The news, gentlemen, is not good: women, qua women, exhibit traits which whether due to the subtleties of the female brain or due to culture, might well make them better financial operatives. This is not to celebrate naive housewife economics, whether the Swabian or Lincolnshire variety so beloved of Dr. Merkel and Mrs. Thatcher. There is a large and emergng body of literature on what we might call the neurophysiology of risk, and among that is the discussion on gender differences. Gillian Tett of the Financial Times has an interesting opinion piece on this. First, we all know that boys will be boys. In finance this manifests itself as excessive overconfidence by males. Males trade more, take more risk and as a consequence tend to find that on average monies managed by males show greater volatility. Women in general take less risk and adopt a more ‘steady’ hand, avoiding excessive trading costs. This extends from trading to corporate activities, where recent evidence suggests that companies run by females engage in less risky activities, with lower merger and acquisition activities and less debt issue. Second there have recently emerged a number of papers on women on boards. My research indicates that the appointment of women to boards is market-negative. This makes sense when you consider the earlier findings; boards more female dominated will take less risk, and recent DCU research notes that this will result in lower (short run) returns. Changing board structures to mandate more female members, something that I would wholeheartedly support, will thus have shortterm costs. In the longer term however there is recent evidence that female chief finance officers obtain loan financing that is significantly lower than the average, demonstrating that while the equity market may penalize the loan market values this tradeoff of longer-term slower sustainability for short-term returns. The market, we should recall, is both a valuation and a voting machine. Thus, negative reactions to female activities is a function of both and if there are conscious or unconscious biases (and some research suggests there are) in either by the dominant group (males) these need to be considered. Third, research indicates that women are more selfless and less selfish than men in economic and financial transactions. Thus financial settings where ‘winner takes all’ are more likely to be attractive to and dominated by men. The testosterone driven ‘you eat what you kill’ attitude of investment banking and trading rooms is thus the natural environment of men, but of course this as we know comes at the cost of overconfidence and excessive risk taking. Boys will be boys. In more social financial situations, such as startups and venture capital situations where success is inherently to be shared, we find as we do that more balanced gender in the investing groups has a major effect. A caveat however is that this depends very significantly on social capital. While women and men may have similar levels of social capital, important in areas such as financial analysts and venture capital, women gain less from this than men. There is some evidence, quell surprise, that there is discrimination against women in the financial industry. Female fund managers, despite having almost more consistent performance than males attract lower inflows; this prejudice also follows through to ‘foreign sounding’ names it should be noted. IPOs with more female involvement tend to be looked on less favorably than those without. Women can indulge in a touch of Schadenfreude however as startups with higher degrees of gender discrimination show markedly lower survival rates., while the higher the percentage of females in first hires the greater the likelihood of success. This is of course entirely in line with the risktaking and selfish approach of men versus the more inclusive approach of women in economic activity, as startups require both drive and collaboration to get over the first few months. The bottom line then is that if you seek shortterm gains, more males would be optimal, while for longterm consistent but per period lower returns, more female. The hare and the tortoise analogy comes to mind. The implications are clear for organizations with different time horizons such as pension funds versus trading houses, and for companies with different time horizons in terms of corporate strategy. A system which is set up and dominated by men is unlikely to be conducive to women success, unless they share the same risk attributes as do men. We need to consider that financial markets are social constructs, and that gender differences (whether innate or cultural) are likely to both impact on that and to require us to consider them when analysing or teaching around them. This entry was posted in Blogpost, Journalism and tagged business, discrimination, economy, entrepeneur, feminism, financial economists, financial services, gender, Pensions, research, risk, women on March 17, 2012 by brianmlucey. In addition to the banking crisis the government also face a series of crises in relation to pensions. There are at least three separate but related crisis around the issue of pensions. Firstly we have a situation where the state is paying pensions, both for public servants and for others, but of current income. Secondly we have a situation where the vast majority of defined benefit schemes in commercial organizations, so my statement was, are underwater. The third is the experience of the last number of years in relation to investments cannot but have heard it chilling effect upon the people’s willingness to engage with financial services, including pensions. At present Ireland is in the lucky position that has a young population. Approximately 17% of the populations are in the elderly category. CSO projections suggest that this could rise to as high as 25% by 2021 and rise to as high as 46% in 2041. All of these persons will be dependent, at least in theory, a pension. From any of them, if the past is any guide to go by, this will primarily be displayed old-age pension. A proportion of these persons will also be the retirees from civil and public service employment, and at least in the medium-term the majority of these will be on the “old-style” pension arrangements, where the pension is tied to the final retiring salary. As of 2009 this liability, according to the Comptroller and Auditor General (p12 and generally here) for public sector pensions alone, was €116 billion. In other words were the state to have to go out, purchase on the open market an annuity the yield on which would be equivalent over the period to the pension to be paid to these public servants this would cost €116 billion. It is inconceivable that this liability can be allowed to continue to grow. Unchanged, the public sector pension bill could reach €5b per annum. The recent changes announced by the government in relation to pensions for public servants being based on a lifetime average will help to reduce the growth of this pension liability. It is entirely probable however that faced with the need to cut both immediate and future expenditure the state will have to move to reduce the actual amount of expenditure on public sector pensions in the near term. The proposed new arrangements would also it appears be applicable, in certain circumstances, to existing pensions. This might mean that public servants find that while their existing built-up pension entitlements stay as they are future pension entitlements might conceivably be linked not to final pay but instead either to average pay or to the consumer price index. Another possibility might be the imposition of additional taxes on lump sums, or indeed full retrospection of the average lifetime he provision. Public sector employees, existing and future, will need to be aware of the fact that pension provision, coming out as it does and will of current taxation, is going to be reduced. Private sector pensions are not in much better shape. Up to 80% of defined benefit schemes may well find themselves in actuarial deficit. Persons paying into Defined contribution schemes have been very badly hammered, especially those coming up to the last number of years before retirement. All of this will serve to throw additional strain on the public purse. Government does have a good plan in the automatic opting in of new employees into a defined contribution scheme. This is soundly based on research, and is to be welcomed. Personally I would prefer to have seen a situation where persons were not easily able to opt back out after a number of years, as is the case. However this will over time results in the building up of very large defined contribution schemes, which will in itself pose problems. For instance, one could easily conceive of a situation whereby faced with pension pots of tens of billions and a government fiscal position that becomes Strained there is a temptation for said government to either engage in financial repression, or to direct pension savings away from market towards government assets. The experience of countries such as Chile and Poland is that strong controls need to be put in place to ensure that management fees of state-mandated pension pots are kept at the absolute lowest level possible. We must also take cognizance of the lessons from behavioural finance, such as a general tendency to overconfidence, loss aversion the tendency of people to over diversify, difficulties in people making decisions when faced with a large number of choices, and other heuristics and rules of thumb which might together resulted in individuals making significantly sub optimal choices in how they allocate their pensions savings. There is a wealth of research from behavioural economics which can guide this , if drawn upon. See here, for issues on individual choice; here for some Australian experience; here for a study of individual issues in dc investing; here for a more general survey. There is a nice piece in business and finance from the Geary institute also worth reading. 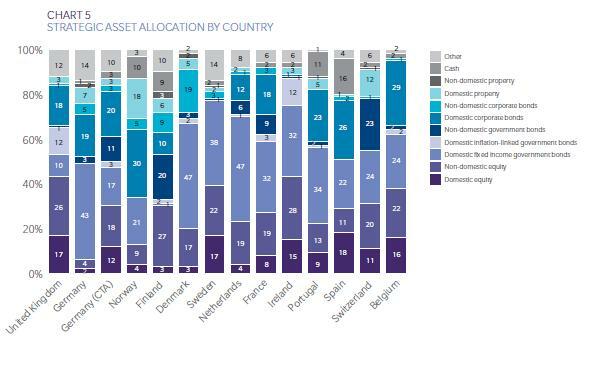 In an environment where there seems to be no such thing as a risk-free asset, where even sovereign bonds are now exposed to the possibility of major losses, where equities may be facing into a secular bear market, and where investors have been badly burned, the appetite for the risk required to grow defined contribution schemes to an adequately large amount of money sufficient to pay the pensions of the contributors is likely to be muted. That would be a pity, as taking risk is the inevitable requirement to ensuring that a decent return is obtained. If we want to provide a decent level of income for ourselves when we retire then we have only two choices. Either We save it ourselves, or we pay for it through taxes. Either way there is a high probability that in the near term we are going to start to pay more. This will result in further withdrawals of money from an already fragile domestic economy. However, there is no choice. This entry was posted in Blogpost, Journalism and tagged economy, Pensions on October 8, 2011 by brianmlucey. The jobs initiative, revealed last week, is something that I have previously welcomed. It’s not so much that the jobs initiative is in and of itself going to create hundreds of thousands of jobs per se, it’s rather that it indicates that the government are fully aware of the seriousness of the unemployment situation, and that unlike the late unlamented predecessors are willing to actually begin the process of public engagement. Much of this is tosh. There is no doubt that over the years pension funds in Ireland have been given very generous, some might say over generous, tax treatment. But there is already in place (writ in the stone of the IMF Memorandum of Agreement , section on fiscal consolidation ) that these provisions will be scaled back. In any case one can think of lots of areas that got overly generous tax treatment that are not being so targeted. Racehorses anyone? As to the argument on fees, this has superficial attraction. Its certain that like most other things in Ireland over the last while the costs of managing ones retirement fund soared. And to be fair the government has agreed to investigate this. However, the government itself has, as is often the case, been a cause of this , so it is alleged, via their fees structure for Personal Retirement Savings Accounts. 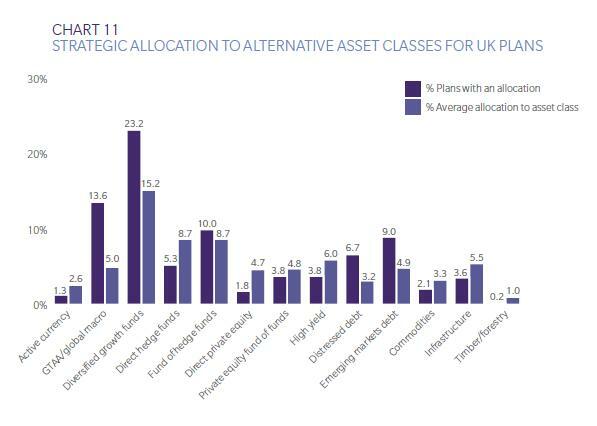 In any case we have a long way to go before people “shop around” for pension fund management, and this levy is being laid not on the profits of management of the assets but on the actual level of the assets. Finally we have the argument about overseas. One of the very few undoubted things we know about finance is that, for most investors, it makes sense to be somewhat diversified. In the case of IRish pension funds one of the main problems they have faced over the years is their relative lack of diversificaton. 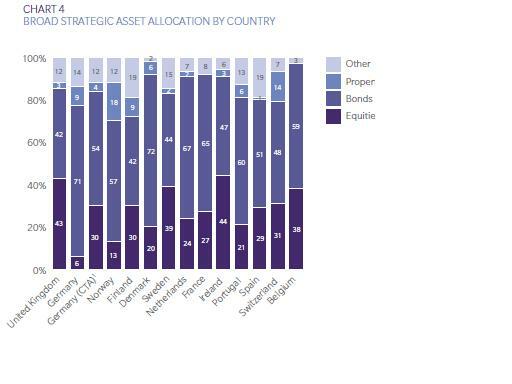 As of the latest Mercer Asset Allocation Survey in 2010 Irish funds held 20% of their holdings in Irish equities and 34% in Irish government bonds. There is if anything too little overseas diversification evident there, not too much. As Talleyrand stated about the murder of a prominent member of the French royal family, the decision to begin to expropriate private savings, no matter for what reason, was worse than a crime, it was a blunder. Their is a long and inglorious history of governments using what has become known as “financial repression” to enable them to close, surreptitiously, the gap between government spending and government revenue. The academic and research literature on financial repression mostly lives in the area of development, and for the most part was, we thought, an interesting if somewhat historical curiosity. We should have known of course that this time is never different. And indeed the author of that eponymous and magnificent book, Carmen Reinhardt, has recently produced an extremely interesting research paper on the issue of financial repression. Financial repression in general refers to situations where the government and the financial system become very much more closely entwined. The objective of this close intertwining is that the government can reduce its debt not only through prudent fiscal housekeeping but also through in some way directing or expropriating private savings, replacing other forms of investment with government debt. This intertwining of course has been going on, a macro level in Ireland, ever since the disastrous events of the first bank guarantee. On a more operational level a number of different strands of financial repression can be identified. Perhaps the most common and indeed historically the most effective way in which financial repression occurs is through the government inducing or permitting negative real interest rates, via a combination of artificially low nominal interest rates combined with a slow but steady dose of inflation, inducing or permitting negative real interest rates. We should be aware that the ECB have an explicit anti-inflation mandate and this therefore is likely to play only a small part if any in any repression. Another form of financial repression is through capital controls, forcing investors to invest monies domestically, again not possible (or perhaps it is, if you listen to this clip from Junker ) within the Eurozone context, but a necessary precursor if anybody was to consider leaving the Eurozone. A third form of financial repression is where the government directs private saving towards its own use. This is usually done via the government directing large pools of private savings, such as bank deposits pension funds, to invest all or a large part of the investment in government debt. The 0.6% pension levy is, in my opinion, a move towards that kind of approach. It forces the private sector investor to underpin the cutting of a tax rate, which would otherwise have had to be met by reduced expenditure elsewhere or by borrowing. While it is an exaggeration to say that the small levy is a smash and grab, it is in my view the first element of a new phase, one that hopefully will not continue. It is essential that the government make it extremely plain that they will not go down the road of recent countries. In Bolivia the government has nationalized pension funds, following the same path as Argentina. In Hungary the state has directed that the in effect mandatory payments into the private pension funds be directed instead to state funds, and a partial version of the same has taken place in Poland. Bulgaria planned to move in a similar direction but union pressure put paid to that plan. A Peruvian presidential candidate has placed nationalizing private pension funds as part of his campaign, although this plan changes reasonably rapidly depending on the strength of perceived opposition to it. These are all desperate measures, and ones that we need to see the government here ruling out. Of course, the converse of this is that the state needs to get its finances in order, sharpish. This will require very sharp reductions in state expenditure, moving as much as possible to close totally the funding gap over two to three years. Doing that will require that all bear the brunt of sacrifice, and in an environment where judges and the top layer civil servants avoided the cuts in pay that others took state leadership will require that not only will these burdens be shared but will be seen to be shared. This entry was posted in Blogpost and tagged Pensions on May 16, 2011 by brianmlucey. 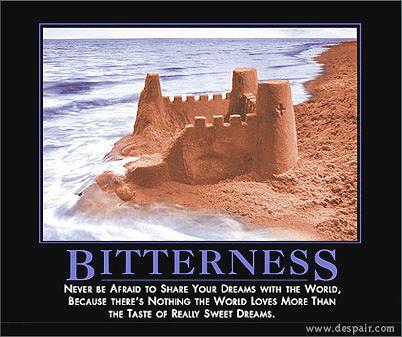 The last week has seen an enormous outpouring of national introspection in relation to how we will get Out of the mess. At the heart of this has been the as ever controversial, polemical, and pungent Prof Morgan Kelly, whose proposal at the weekend that we ditch the bailout and simultaneously close the gap in the national finances in the course of one year has been at one and the same time reviled and welcomed. Kelly deserves enormous kudos for being a (almost) lone voice in the wilderness, calling the property bubble for what it was and in doing so dropping the scales from many of our eyes, and more latterly for holding up a stark mirror to the folly that has been the banking rescues. It’s probably no exaggeration to say that millions of words have been written about the Irish banking collapse, and about the consequential economic disaster. Curiously muted has been the discussion around jobs. At start of 2007 unemployment was just over 4%, while now it is now at 14.6% at last count. While this is not by any means the worst in the European Union is a very very serious and rapid deterioration. This tripling of unemployment has of course occurred against a background of massive emigration, and the headline unemployment rate masks startling discrepancies. Overall male unemployment is now just under 18%, while for men between the ages of 20 and 24 is nearly 33%. A very useful recent post on the Irish economy blog discusses the issue of male unemployment. Nobel prizes and economics have been awarded for people who have worked on the issues of unemployment, unemployment solutions, and the issues of the effect of unemployment, particularly when young, on long-term work prospects. It against this background that one cannot but welcome the focus that this government has now shown in trying to begin the process of reducing unemployment. Under the watch of Brian Cowan we saw not only the collapse of the Irish banking system, not only the collapse of the Irish fiscal system but also the collapse of the Irish employment system. When Hercules had but one Augean stable to clear out this government has three, any one of which would daunt the staunchest. The initiatives themselves are worthy, but will hardly reduce the unemployment level by much. At most they can best be seen as an opportunity to ensure that certain categories of industries are favored, that certain types of jobseekers are favoured, and that the government is seen to be doing something. Being seen to do something as important, as it might well give people a degree of confidence, that somebody somewhere is trying…we have a small reduction in the lower rate of value-added tax, which will almost certainly not on past experience translate to a reduction of prices for the Irish tourist product, prices tending to be sticky downwards; we have some additional expenditure on minor roads; we have a reduction in PRS I at the lower level but only for a time limited period; we have some incentivization for universities to seek additional non—Exchequer funds and to be then allowed to employ people; and we have the introduction of common tourist Visa between Ireland and UK, in hope of cashing in on large numbers of non EU residents visiting the Olympics one assumes. The largest single amount of jobs noted will be training and internships, worthy but not self evidently sustainable in the long-term. No mention is made of serious reform of FAS, there is no serious evidence given to a concentration on youth unemployment, other than the assumption that persons going back into training and education will be young, there is little evidence that the national obsession with the construction industry has finally been purged. Commenting on the jobs initiative the entrepreneur Jerry Kennelly of tweak.com welcomed it, insofar as it went, but pointed out that the government really need to get serious with telling people who had worked in the construction industry that their jobs were irretrievably gone. He suggested that the need to be given much more significant incentives to reskill, or, and this is characteristic of the frank way in which she speaks, beautiful to emigrate. No politician is going to tell people to emigrate… that would smack far too much have Brian Lenihan senior and his statement about a small island. Examining the jobs initiative one sees that the largest single amount of money being spent is in the reduction of the value-added tax. The assumption appears to be that if prices fall more people will spend money and more people spend money domestic demand increasing will result in increased employment in the retail hospitality and other industries. In addition, while I don’t believe necessarily that the minimum wage, which is in any real sense pretty paltry, is a serious disincentive to employment, it does also seems somewhat perverse that in an environment where we should be taking every opportunity to enhance the competitiveness of the nation we increase, at least relative to where it has been for the first couple of months, the cost of employing persons. Before we get too carried away with congratulations however we need to be cognizant of the fact that this is a jobs initiative built upon an extremely unfortunate foundation. The proposal to levy not the premiums but the actual asset values of pension funds is entirely regrettable in my view. Irish pension underfunding is a massive problem not just for the public sector because of the private sector. At least in principle in the public sector all employees who are members of the defined benefit scheme can hope there would be tax revenue to pay their pensions. In the private sector people have to put aside funds, and while there are very generous tax breaks for doing so the long-term argument in favour of encouraging private sector pension provision is indisputable. Make no mistake; this is a levy, a tax, on thrift. For every multimillionaire who has put aside vast sums of money as tax shelters there are a dozen or more small to medium business owners who have put aside a modest amount of money to try and ensured they will not be reliant simply and solely understating their old age. It is astonishing that the pensions board has not been up in arms about this, in particular the consumer and pension representatives. What we have here is a retrospective tax on saved income, and if constitutional there is no reason why such a tax cannot be applied to bank deposits or other forms of wealth. Taxes on income from such savings are one thing but this is a new departure. And it’s an unwelcome one. If the government can levy on the wealth, the savings, of persons accumulated in pension funds why can they not so similarly lengthy on other forms of saving? Could the government, using the same justification is here, put in place a 0.6% levy on the level of deposits in Irish banks? The fig leaf that has been used here is that there has been very generous provision for tax relief and pensions investments over the years, and that it’s appropriate that this be retrieved. 2 problems arise with this: first will we see this logic applied to the recouping of what ought by the government’s logic be “excess” wealth accumulated through other areas where there has been overgenerous tax provision such as the bubble wealth accumulated by developers and speculators in land or to the very large bonuses paid by failed banks to the executives who led them into failure, and secondly the government is already committed to the IMF deal which involves a reduction in the future of the tax incentives for investment into pensions. One has to reluctantly conclude that having given a public, electoral, commitment to the idea of a jobs budget that then became a jobs initiative the government felt it had no choice but to continue to do something. The Financial Times has suggested that some government election policies, this amongst them, are best left unfulfilled. As I have said doing something is a good idea, the individual ideas are not themselves bad, it gives a strong signal that the government is at least thinking about the unemployment issue, and they have to start somewhere. However there are other places than the pensions funds of private savers that could have been used to fund the reduction in value-added tax, which is at the center of this initiative. One obvious place would have been the largest single tax break (above the individual tax credits), which the state gives, namely the exemption of the principal private residence from capital gains tax. Important research on the cost of various tax incentives was undertaken by Dr. Michael Collins of TCD. He finds that the total amount of tax foregone by the exemption of the principal family residence from capital gains tax was something of the order of €2.4 billion per annum, albeit based on 2006 Data. The total sum estimated to be raised in a year from the pensions assets levy is some €470 million. Even allowing for the collapse in property values from their bubble prices it should be entirely possible to raise a goodly chunk of this by the exemption being removed. This entry was posted in Blogpost, Journalism and tagged Pensions on May 11, 2011 by brianmlucey.